Liquidity Collapse – FATCA, Manipulations, or Both? QUESTION: Marty; do you think that the decline in liquidity is linked to all the manipulations that you fought against are now being exposed? You warned that with the decline in liquidity volatility will rise. It is interesting to watch the lower gold goes the more these people seem to hate you. ANSWER: There is hardly a market the money center banks have not manipulated with the trend. 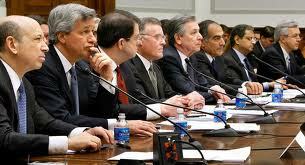 They were warning Congress that preventing them from trading will collapse liquidity. Yes, perhaps cutting their wings on proprietary trading has contributed to the sharp decline in liquidity, but the introduction of FATCA has probably done the lion share of damage causing the real collapse in liquidity that has NEVER recovered since the collapse 2007-2009. Liquidity remains at about 50% of what it use to be and this means when we turn down next, VOLATILITY will rise. One client in Switzerland wanted to open a brokerage account with one of the major US firms to deal with a broker who was familiar with our model. They would not allow that and stated he could only trade through their international desk. The true story, you cannot even select your own personal broker because the big firms need to comply with snitching on everyone reporting back to their various countries what they are doing. Needless to say, the account was not opened. There is one man fighting against the FATCA trend. The settlement of the tax dispute between the U.S. and Switzerland has been blocked by Senator Rand Paul once again on Wednesday. This includes ratification of five control agreements, which includes the one with Switzerland. The agreement is intended to make it easier for Swiss banks to provide names of American tax evaders to the IRS and FBI. To settle the tax dispute, the Obama Administration has required customer names be turned over in addition to outrageously high fines.The US authorities have been targeting about a dozen Swiss banks, including Julius Baer and the cantonal banks of Zurich and Basel. 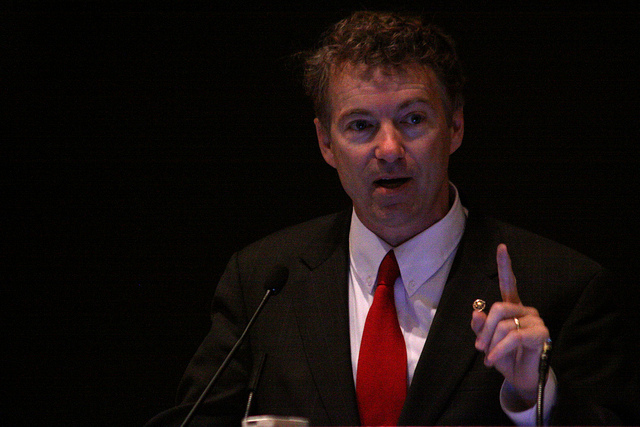 Paul explained his refusal centers on the concern that foreign governments would be simply in control of Americans worldwide. “We must not forget the innocent Americans that do not break the law and have a right to privacy.” Paul is demanding that the arrangements for the exchange of information be deleted from the agreement. Rand Paul is effectively standing up against FATCA, but one man alone cannot save the world economy. The fact that he is standing tall on this issue deserves tremendous applause. Nevertheless, liquidity has collapsed and there is no putting this back in time to prevent the downfall that lies ahead. Paul insists that the relationship of a citizen to his state, including his tax affairs, is a matter of constitutional privacy. Control of that information is highly dangerous and unconstitutional. Unfortunately, far more serious on the horizon remains the control information among countries. Citizens have not made a partnership agreement with the world community, yet are losing their privacy and have obligations imposed upon them by everyone. The G20 decided that this control information is automatically passed among nations in the future and have embarked upon the technical preparations to do so. The citizens of all countries have no democratic say in the G20 – this is purely a dictatorial consortium of governments sharing info to hunt down capital everywhere because they are incapable of running their operations legitimately or within the bounds of their fiscal responsibility. It is a combination of these trends that is destroying the world economy, not just the manipulations of the money center banks that have been going on from controlling storage to fixing prices in commodities and interest rates. Of course, there will be those who hurl all sorts of names at me because they cannot articulate any truthful facts other than their self-interest in promoting some agenda. It is the oldest game in the book. If you really cannot argue the message even with fake data, you attack the messenger. I cannot imagine how these people can say I am wrong, the markets are manipulated so gold will decline unfairly, but that’s ok, still buy more. Who are they being paid by to get people to buy in a declining market? Even if you look at the stock market. Here you have the majority of talking heads constantly saying the market will crash. Others just write nonsense that Wall Street is always optimistic and is ready to crash. Talk to brokers and you find that the “retail” players that typically rush in and buy the highs in stocks are not there. This is part of the sharp decline in liquidity. We are clearly not in a Phase Transition in the share market. Nonetheless, they desperately try to trash the rise in the share market as false to justify as always buying gold. Nevertheless, you have an overwhelming amount of gibberish that speaks the same traditional relationships like a broken record. Things have changed. If the stock market crashes today, where do people run to? Bonds as always? But if governments are the problem, what then? The gold promoters keep saying the same thing since 1971. They preach the dollar will collapse and only gold will rise, but we have been waiting for that more than 40 years now. You would think they would give up. but no, there seems to be a fresh crop of people to keep selling the same story to over and over again. We are in a very difficult period where the old relationships are changing because the real problem is on the government side – not the excess of the private sector. All of these manipulations have been within the trend – they have not altered the global trend at all. The Sovereign Debt Crisis has been set in motion after World War II and governments have been borrowing constantly with no expectation of paying anything back ever. It is one giant Ponzi scheme rolling over the debt continually. This is like an aircraft carrier. You cannot simply change course and turn around like a speed-boat. These manipulations can increase the volatility but they can never transform a bull market into a bear market simply because everything is connected. Of course the gold promoters want to pretend they were right and the manipulations are why they are wrong. Sorry – it is the analysis that is wrong. If China did not peak in 2007 and the place was still expanding, they would still be a buyer of commodities and there would be no bear market in many. 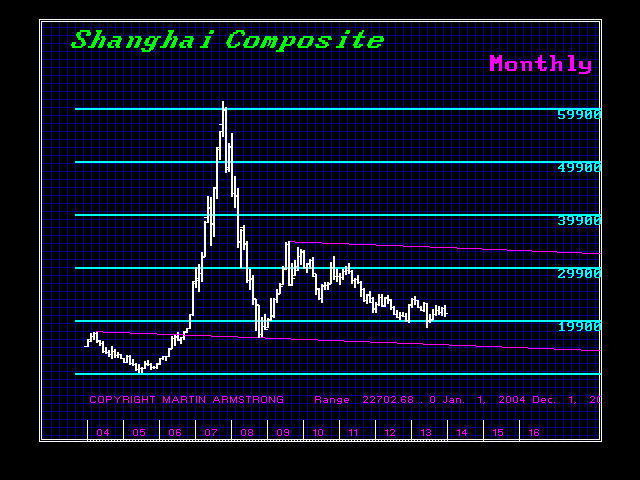 But capital began to shift from South East Asia into China in 1994 when those markets peaked. That resulted in the classic 13 year rally into precisely the peak of the ECM 2007. Now a 13 year decline in the economy points to the low in 2020. Sorry – it is precisely on schedule. Then there are the Baby-Boomers. If they do not exist, then there would not have been a continued bid to lock in fixed long-term income for retirement and 30 year bonds would have remained at the old 8% benchmark. However, everything is connected.and the overall trend of everything dictates the future. That makes the size of investment just under $40 billion – a tiny fraction of even the Fed’s quantitative easing at the monthly level of $85 billion. Yet to listen to the gold promoters, you would think the entire world is somehow in conspiracy against a market that is such a tiny fraction of the world economy estimated at about $85 trillion annually. Yet the entire world is wrong – they are right. According to them the entire world is manipulated to ensure gold declines despite the fact that gold is only .00000235294% of the world economy. I’m sorry. I like gold. I give $20 gold coins as gift to children for birthdays. But the truth is the truth. Gold will rally when everything is lined up. With the economy turning down, jewelry demand declines sharply. It is only natural for the price to decline as the demand for gold declines. Despite all the protests, by no means is gold only for investment. Gold has its place and its role within the global economy. It is a hedge for individuals against government – not inflation nor is it suitable for institutional beyond a capital play since it yields no income. Those who hate my guts claiming the decline in gold is all manipulation are just to biased. They remain blind to the big picture and refuse to see gold and its place within the world economy. Gold will rise – for nothing goes down forever nor does it rise forever. Everything is connected and the sooner you get to see the world through clear glasses, the sooner you will make money. So what is this all about anyway? Proving a theory that the world will collapse and only gold will survive? At times it seems to rise to the level of a gold religion. This is about surviving the economic storm that is on the horizon? Quite frankly, I could care less what the instrument is to preserve wealth be it gold, soybeans, or plastic jars. The purpose of analysis is to survive – not sell an idea to prove you alone are right.